Online Lifetime Collection Auction — Harritt Group, Inc. 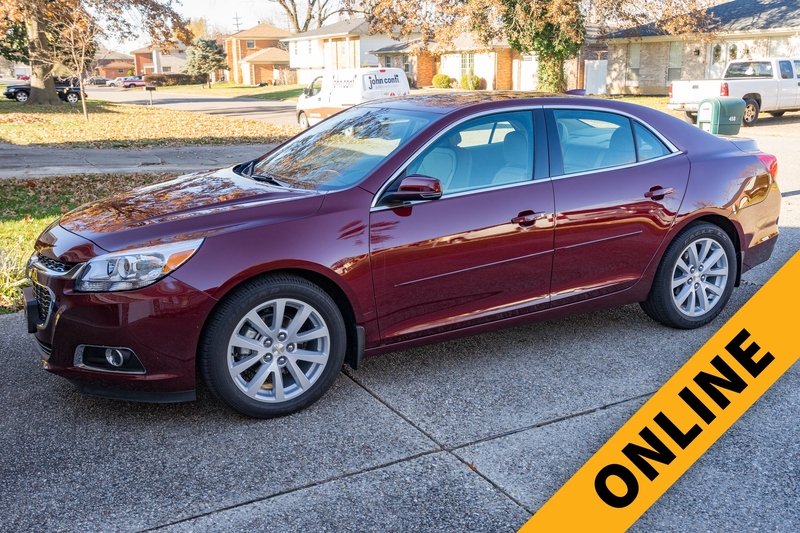 Selling a one-owner 2015 Chevrolet Malibu 2LT and the personal collection of Judy Hayes including 1800’s cherry reproduction furniture, quilts, hummels, Gorham dolls, jewelry, coins and more. One owner, four door sedan, butte red metallic color, 2,501 miles, cocoa leather interior, ecotec 2.5L, 4-cylinder engine, backup camera, advanced safety package, copy of original sticker cost new $30,085. Sells with reserve. Reserve met! Reproduction 1800’s cherry furniture include 12-pane corner cupboard, full size poster bed, glove box dresser with mirror & nightstand, drop-leaf dining table & 4 chairs, 2 marble top lyre lamp tables, quilt rack and swan arm rocker, antique cherry plantation desk & 2-drawer stand table, ornate mahogany lamp table, curio cabinet, oak china cabinet, display cabinet, lingerie chest, maple dinette set, painted cupboard w/cat, traditional sofa, arrow back arm chair, Victorian parlor chair, oak rocker, shaker style chair & rocker, 4 primitive chairs, maple child’s rocker, stand table, 3-leg plant stand, organ stool, primitive foot stools, 2 hump top trunks, cedar chests, vintage console stereo, oak Unique treadle sewing machine and more. (43) Hummel figurines, (13) Hummel bells, (20) Hummel Anniversary plates, Hummel clock, Hummel framed needleworks, (24) Gorham music china dolls, (5) Ray Harm prints, (4) quilts, crystal glassware, Noritake china set, Johann Haviland Bavaria china, Lenox ivory & gold edge china, Rookwood vase #2591, blue & white stone pitcher & butter crock, silver plate items, folk art checkerboard, vintage Ventura luggage set, Thorens Swiss music box, Christmas decor, Byers Christmas carolers, Singer sewing machine with cabinet, Fenton yellow satin glass table lamp, Gone With The Wind table lamp, vintage Clubware dutch oven roasters, cranberry Kings Crown glassware, vintage Clarksville & IU yearbooks, galvanized washtubs and trash cans, Fibber McGee closet and more. Mens 14K gold Hampden pocket watch, vintage ladies wrist & necklace watches, 1960 Clarksville class ring, gold lapel pins & charms, antique cameo brooch, silver charm bracelets, large selection of costume jewelry, large selection of coins including (4) Morgan silver dollars, (2) Silver Liberty Peace dollars, (5) Eisenhower dollars, (6) Benjamin Franklin half dollars, (8) John F. Kennedy Silver half dollars, (13) silver quarters, (33) John F. Kennedy 40% silver half dollars, (71) Pre-1965 silver dimes,1965 United States Mint set, (2) Bicentennial silver uncirculated coin sets, 1999 24K gold plated coin set, $2 bills and more. Lewis & Clark Blvd. to Eastern Blvd. south to left on Kensington Drive to auction on right.